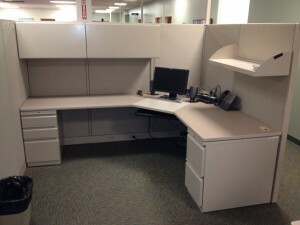 These used Concensys 8×6 L-Shape cubicles offer plenty of room for offices that require a wide berth for desk space. The 69 inch high cubicles offer plenty of privacy and noise cancellation, which are both factors in your employees being able to work comfortably and effectively. Spine consists of two 30 inch wide panels, along with one 36 inch panel. The wings are two 36 inch wide panels. Every station features a 30×72 inch work surface, as well as a 24×66 inch worksurface. Also included are two pedstals, and an articulated keyboard. Most have two closed overhead bins, as well as an open shelf. These are very good as-is condition. No Comments on "Used Concensys 8×6 cubicles"